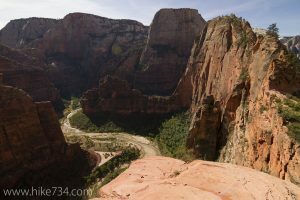 For those looking for incredible views similar to Angels Landing, but the thought of scrambling on an exposed, cliffy ridge is dissuading, the hike up to Scout Lookout provides a fantastic destination hike. 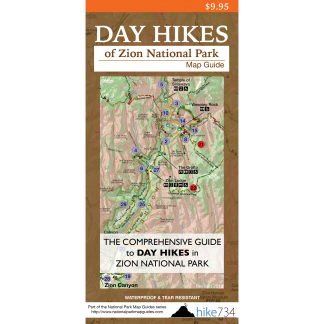 This very popular and busy hike starts at the West Rim trailhead across from the Grotto. A footbridge over the Virgin River and a right turn heading upstream lead you along the northwestern shore on a relatively level path. After about a half-mile, the trail begins to switch back up on a hot, paved slope. The views keep getting better with every turn as the expanse opens up below you. This section of trail has steep drop-offs, but is wide, which is helpful for those with a fear of heights. Shaded relief is found when the trail turns up into the aptly named, Refrigerator Canyon. Impressive rock walls tower above with overhangs that are picture worthy. After a gradual grade, the trail turns and you face the famous Walters Wiggles feature of tight switchbacks up towards Scout Lookout. These memorable switchbacks are a feat of engineering, and a treat to admire during stops to catch your breath. At the top of Walters Wiggles a short traverse brings you to Scout Lookout with amazing views of the Virgin River as it comes out of the Narrows and down onto a rock outcropping called the Organ. From here you can head back down or explore further. One option for further exploration is Angels Landing. (See more in the Angels Landing description in 5-10 mile hikes.) A second option is to continue north along the West Rim Trail that follows the rim for a wonderful look up the canyon. It then continues onto the slickrock with a unique view down onto Walters Wiggles. Trailhead: Take the National Park Service’s free shuttle to the Grotto stop in the main Zion Canyon or drive the Zion Canyon Road if the shuttles aren’t running and the road is open to private vehicles.